I love mangoes and their varied character. 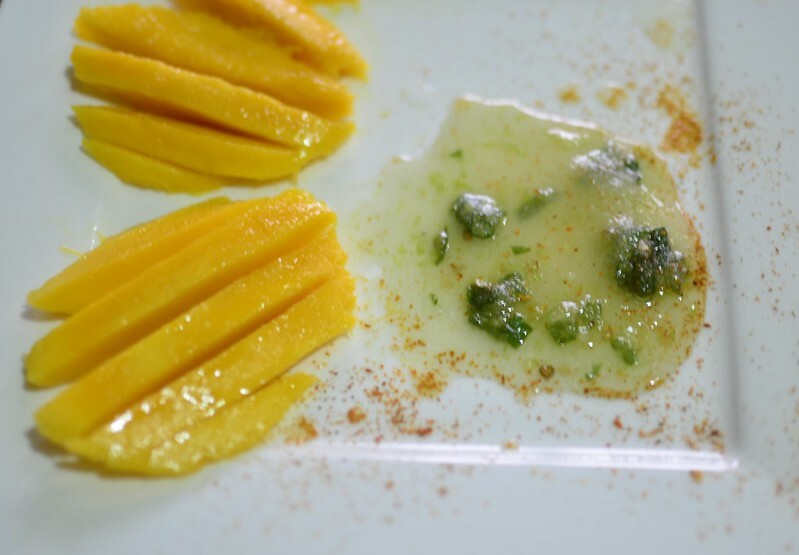 To me, the mango is itself in so many ways – sweet and sour and tart. Just like it’s seed. Gnawing on one, I often find myself licking the core of a mango with a puzzled look as I navigate the compass of flavours, flossing my teeth on fibres that look the same yet aren’t. Some are rich and sweet, not in a toothaching manner but blossomy, pleasant. And then there’s sour. So sour my tongue recoils. Before we hit tart. Sharp. Fresh. Awakening. I like that the mango is celebrated in so many phases of it’s existence. When it’s green, it is celebrated in many parts of Asia from Vietnam to India. The Indian Amchur, Amchoor is a green-brown powder made from sun-dried, green mangoes, lending sour and tart flavours to dishes and drinks. Aam Panna is a refreshing north Indian drink made from green, un-ripe mangoes, often boiled or roasted then puréed. To finish, the pulp is blended with mint and sometimes cumin. The result is a thrist-quencher and apparently prevents the loss of iron and body salts, important during the very Indian summers. Over to Southeast Asia where the flesh of the green mango stars in savoury salads. I’ve enjoyed them in Malaysian, Thai and Vietnamese salads. Sweet, sour, salty and spicy make a heck of wake-up call for the palate. Sometimes too, cooks use it much like pawpaw (papaya) and pineapple to tenderise meats. In Latin America, as well as Southeast Asia, snacks of mango pieces tossed in chili salt – a sweet, salty and sour combination of sugar, salt, chilies are common. And a huge favourite of mine. Convincing even the pickiest eaters to succumb. Take 9-year old, R, my daughter who does not like plantains in any form, particularly the ripe ones which she finds sickenly sweet. And till April this year, she couldn’t stand mangoes. 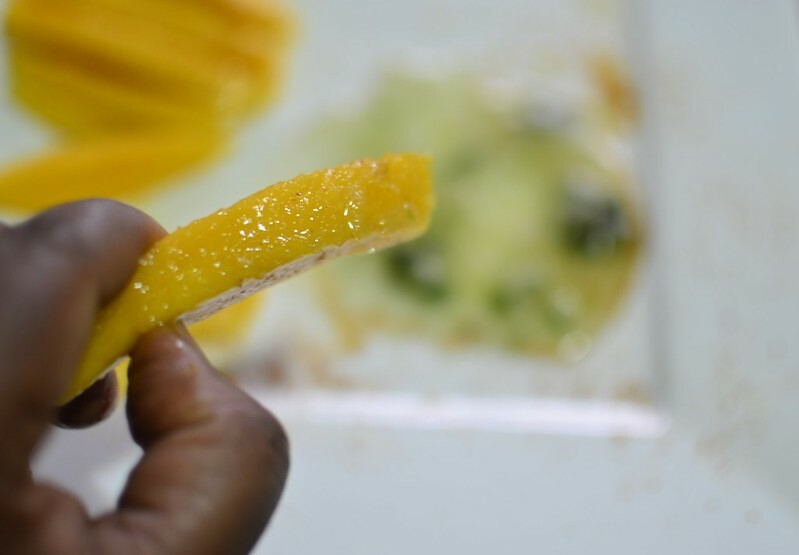 Two things have won her over – the mango passion fruit puree which she spoons, licks and begs for…and this – this snack of just-ripe mangoes dipped in a spicy condiment. And that ladies and gents is something, for R isn’t easily convinced or swayed by people waxing lyrically about food or other things. It don’t matter if the ‘lauder’ is mother, sister or friend. So, give this a go people, it takes so little to rustle up and yet the rewards are awesome. Before dinner, or just after. As an afternoon tummy filler too. My mango of choice is the ‘green’ and under-ripe version of what is known in many stores and stalls as ‘Normal/ Yellow’ mango. I choose firm fruit with no ‘give’ when pressed. Sometimes, I go for those that show the slightest hint of ripening for I possess a sweet tooth. 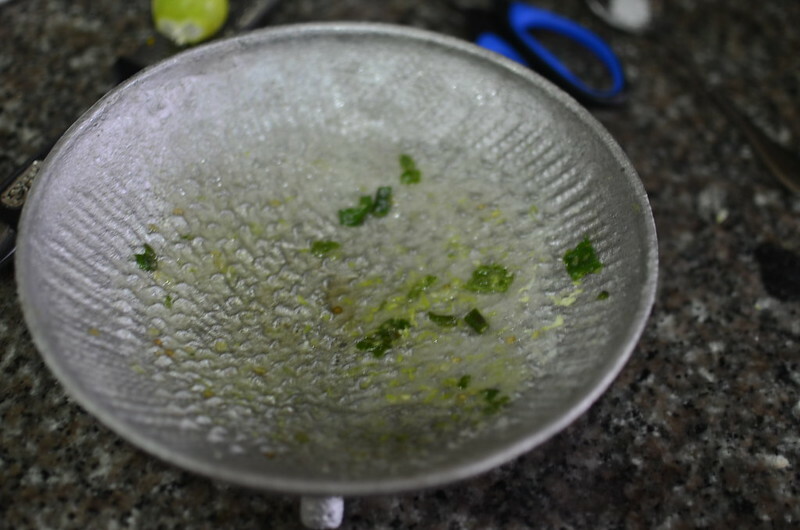 And then I make the simple dip with 4 ingredients – sugar, salt, chili and the fine zest of lime. I like to add some colour by sprinkling some chili powder or paprika. 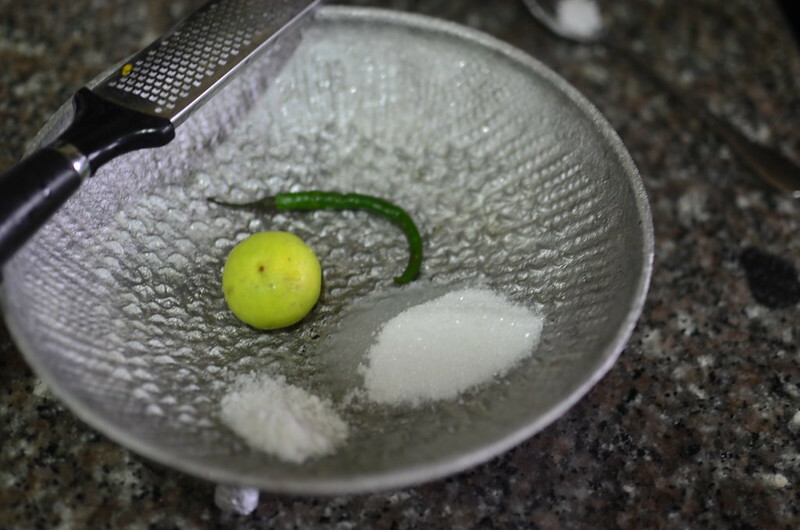 Put the sugar, salt and chilies in your mortar and crush to combine. Stir in the lime zest and remove from mortar. The result might be more liquid than dry- this in no way affects the deliciousness.